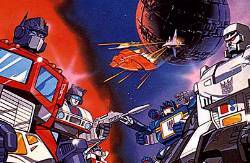 Here is the entire listing of American Transformers cartoon from the 1980's, including the movie, listed in production/airing order (not always 100% accurate to true chronological order). The different "season intro" links in the lists are the different, 30-second season intros shown at the beginning of each episode, right before the episode actually starts, as .AVI video/sound files, inside .ZIP files (Need the WinZip program to open these .ZIP files). They're the same things you see at the beginning of any other TV show before the actual episode starts, which plays the theme song and shows the show's characters in action. We at PVTF will be making our own season intros for our "virtual seasons," using old 1987-1990 TF toy commercials' cartoon clips, compiled into simple 30-sec intros, and posting them here, along with every new "virtual episode" each of us writes and finishes. Thanks to the TeleTran 3 CyberSite for the episode listings. 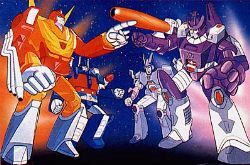 You can find episode summaries at theAdequate.com Tranformers Universe's G1 Episode Guide site. Also, many of the ACTUAL episodes, and the movie, listed here are still available on VHS, some of which have been rereleased on *new* VHS videos, including the movie. 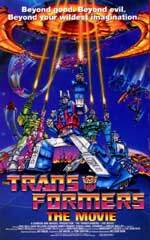 The Transformers movie itself was also recently rerealeased on DVD, as well as the entire run of seasons 1 and 4. All of the current and upcoming Transformers VHS video and DVD releases in the United States are by Rhino Home Video, while other companies, such as "Seville" in Canada, release stuff there.